Welcome to Chef Depot! 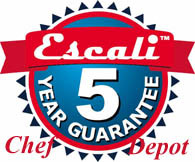 Every item we sell is tested by Certified Chefs for quality and value. Search 50,000 great products! New products every day! These are only a few of our popular brands! Please Click on the Logo to shop by brand! 100% Secure shopping guaranteed! We have hundreds of other brands too! Email Us Here!